Description: This perennial wildflower is 1-3' tall and unbranched. The erect central stem is light green to pale purple, terete, glabrous, and often glaucous. A non-flowering plant has a single compound leaf at the apex of this stem, while a flowering plant has two compound leaves. The lower compound leaf of a flowering plant is located toward the middle of the central stem, where it is divided into a whorl of 3 compound leaflets. Each compound leaflet is ternately divided into 9 simple subleaflets that are arranged in groups of 3 (2 lateral groups and a terminal group). Less often, a compound leaflet may be divided into 15 simple subleaflets that consist of 2 additional lateral groups. The basal stalks (petiolules) of the compound leaflets are long and ascending; they are light green and glabrous. The subleaflets are 1-3" long and ¾-2" across (or occasionally wider); they are broadly ovate-oblong to obovate-oblong in shape and smooth along their margins, terminating in 2-5 cleft lobes with blunt tips. The upper surface of the subleaflets is glabrous and either gray-green, yellowish green, or medium green, while the lower surface is pale green and glabrous. The slender basal stalklets of the subleaflets are light green and glabrous. The upper compound leaf of a flowering plant is located under the inflorescence. This compound leaf resembles the lower compound leaf, except its 3 compound leaflets are smaller in size because they have only 3 subleaflets each. On a flowering plant, the central stem terminates in a floral panicle about 1-3" long that is rounded or elongated; each panicle usually has 5-30 flowers (rarely more). Individual flowers are about 1/3" (8 mm.) across, consisting of 6 petaloid sepals, insignificant petals, 6 stamens, and an ovoid ovary with a beak-like style. Depending on the local ecotype, the oblanceolate sepals are greenish yellow, greenish brown, or greenish purple. Underneath each flower, there are 3-4 green bractlets that resemble sepals. The branching stalks of the panicle are light green, glabrous, and ascending. The blooming period occurs from mid- to late spring before the leaves have fully developed. 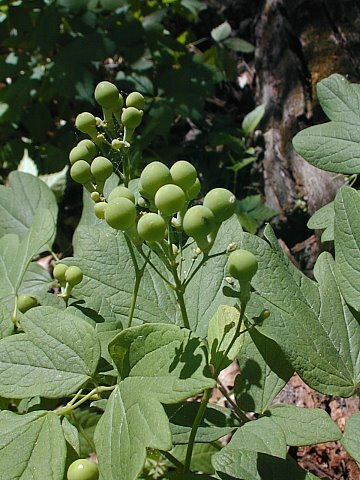 Afterwards, the flowers are replaced by berry-like seeds that are about 1/3" across, globoid in shape, glabrous, and glaucous. These seeds are initially green, but they later become bright blue at maturity during the summer. The seed coat is fleshy and contains carbohydrates. The root system is rhizomatous and fibrous. Cultivation: The preference is dappled sunlight during the spring, followed by light shade during the summer, at a location that has average moisture levels and fertile loamy soil. The soil should also contain abundant organic matter from decaying leaves and other plant materials, as typically occurs underneath trees. The large seeds are difficult to germinate. However, once it becomes established at a favorable site, Blue Cohosh is long-lived. 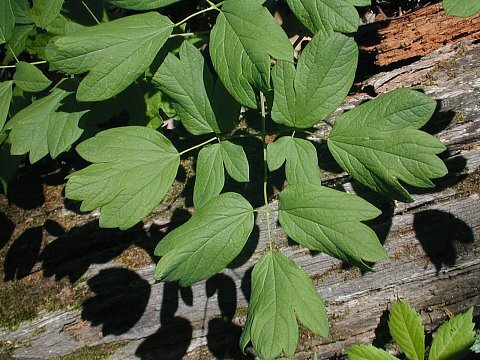 Range & Habitat: The native Blue Cohosh occurs occasionally in central Illinois, northern Illinois, and the Shawnee Hills of southern Illinois. In other areas of southern Illinois, this wildflower is uncommon or absent. Habitats include rich mesic woodlands, bluffs, and wooded slopes of large ravines. This relatively conservative wildflower can be found in woodlands dominated by either oaks or maples where the native ground flora is still intact. Faunal Associations: Both pollen and nectar are available as floral rewards to insect visitors. These visitors include miscellaneous flies (Syrphid, Tachinid, Muscid, etc. ), parasitoid wasps (Braconid, Ichneumonid, etc. ), small Halictid bees (Lasioglossum spp., etc. ), and bumblebees (Robertson, 1929; Hannan & Prucher, 1996). Apparently, very few insects feed destructively on the foliage and other parts of Blue Cohosh. Caterpillars of the moth Clepsis melaleucana (Black-Patched Clepsis) and the plant bug Metriorrhynchomiris dislocatus have been observed to feed on this plant (Covell, 1984/2005; Knight, 1941). Both of these insects are polyphagous. Among vertebrate animals, both the White-Footed Mouse and Woodland Deer Mouse feed on the berry-like seeds of Blue Cohosh (Hamilton, 1941). However, because of the bright blue coloration of the fleshy seed coats and their carbohydrates, woodland birds are probably the primary dispersal agents of the seeds, which are known to be toxic to humans. Because the bitter-tasting foliage of this wildflower contains toxic glycosides and alkaloids, it is rarely eaten by White-Tailed Deer and other mammalian herbivores. Comments: Generally the subleaflets (or simple leaflets) of Blue Cohosh are remarkably similar in appearance to those of Meadow Rue species (Thalictrum spp. ), except they are often grayish green or yellowish green and tend to have more terminal lobes (2-5) than the latter. However, the flowers and berry-like seeds of Blue Cohosh are quite different from those of Meadow Rue species, and they belong to separate plant families. In addition to the typical variety of Blue Cohosh that is described here, there is also a more eastern variety of this wildflower that is referred to as Giant Blue Cohosh (Caulophyllum thalictroides giganteum). Thus far, Giant Blue Cohosh has not been found in Illinois. It differs from the typical Blue Cohosh in having slightly larger flowers (about ½" across) that are deep mauve or purple; these flowers bloom about two weeks earlier before its foliage has unfolded. The subleaflets of Giant Blue Cohosh are slightly larger in size as well. It is often classified as a distinct species, Caulophyllum giganteum.